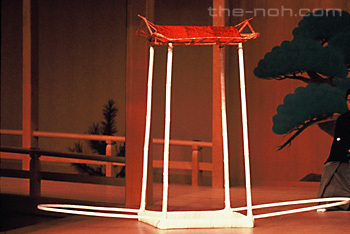 On the noh stage, large realistic props, scenery or revolving stages are not used. That is not to say there are no props. Noh employs the use of tsukurimono (lit. made things). 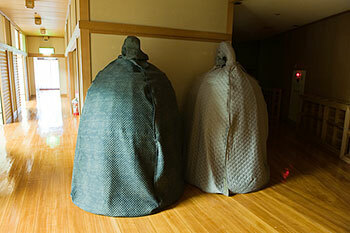 There are many types of large tsukurimono. Rather than realistic representations, these simply made props are more symbolic and can imply a: shack, rock, boat, bed, well, bell, castle, fence or grave among other things, to effectively help convey the story. For example, four bamboo pieces can be lashed together with cloth to create the idea for the frame of a house or a well can be represented as a bamboo frame with a cypress branch attached on the top. As tsukurimono are merely created as symbolic representations, they can be easily built and broken down. In fact, they are usually made the day of a performance by apprentice performers at the theatre. Their construction is comprised mostly of a bamboo frame wrapped in strips of cloth. They can generally be created in about one hour and are taken apart and returned to storage after being used. While the use of priceless family heirlooms such as masks and costumes is reserved for the more experienced performers, apprentices are permitted to make tsukurimono. Apart from all other tsukurimono, the bell from the noh Dōjō-ji is exceptional. Different from the simplistic structures of the other tsukurimono, the Dōjō-ji bell has about 80kg of lead weight attached to the bottom. 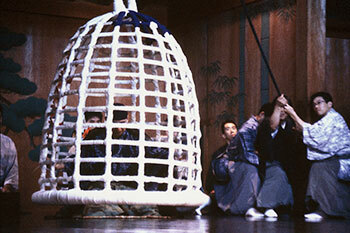 The reason for this is that during the climatic scene the shite, in this case a shira-byoshi (female dancer dressed as a male), leaps into the bell as it falls to the stage. The weights are needed to maintain the proper balance of the bell as it falls, so that the shite can gauge the timing. Due to the complicated nature of the bell, the frame and exterior take about one day to build and prepare. Consequently, it must be made in advance at the theatre by the apprentices and covered in a cloth until the performance. It is the responsibility of the shite to prepare the interior of the bell. 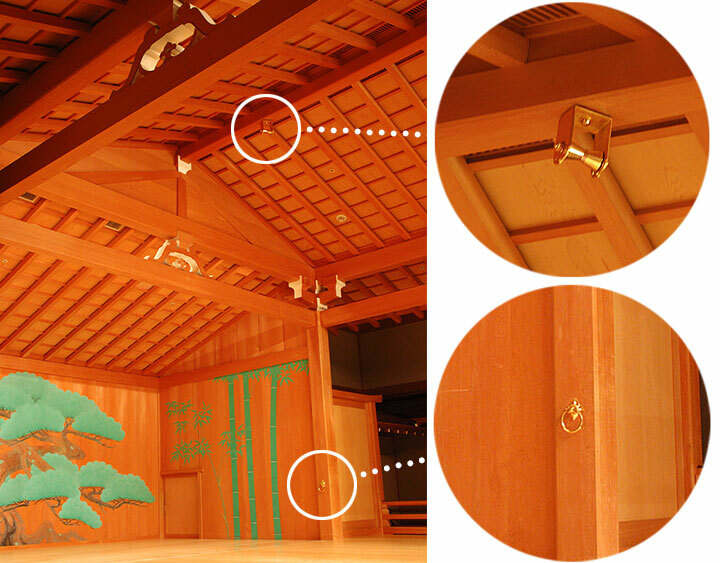 Because of its special nature as being one of the “right of passage” noh, preparing the interior is a secret. Only the performer and those who have done it before are permitted inside the bell. 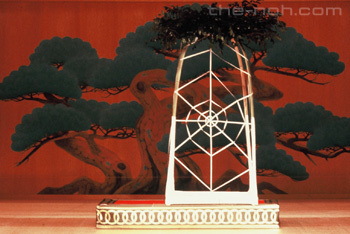 Click here for Dōjō-ji in the Noh Play Database.